Over the next few days, I will be sharing some articles from guest contributors, as I will be away in Venezuela to conduct pastors training for a couple of days. Today’s article is from a close friend of mine, Rob Burns of Crestwood Presbyterian Church in Richmond Virginia. That’s certainly enough affirmation to propel us to repeat our Trunk or Treat event another year. 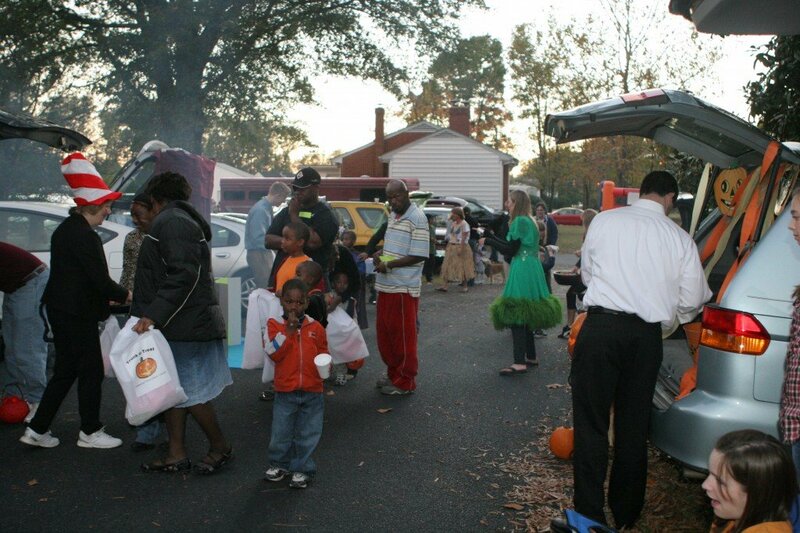 Trunk or Treat is an alternative event we make available to our community on Halloween night. Church members come to the church in costume, also decorating the trunks of their cars, and children come to the safe well-lit environment of the church parking lot and proceed from car to car collecting candy. We also threw in free hot dogs, a couple bounce houses and a petting zoo to add to the energy. After several years of offering this event at our suburban campus, last year we moved it to our urban campus where we felt there was greater community need. We were overwhelmed with the turnout, hosting 200 neighbors in a matter of hours. Our own congregation was energized by the community response, and of course, the neighborhood was tremendously grateful. Our urban campus is situated in a changing neighborhood which now reflects an ethnic population unlikely to attend our worship services. Knowing that, we still proceeded with the event in an effort to bear witness to Christ’s love for and commitment to those who live nearby. As far as we know, we did not receive any worship visitors as a result of Trunk or Treat. However, we are engaged with our community for the long haul and believe that events like this grease the wheels for evangelistic outreach, even if it does not result in our own congregation’s growth. We did not include any obviously spiritual component, other than providing an information handout on our church. However, this year we expect to offer simple prayer ministry in some form. We also may make our sanctuary available to attenders, though we realize that parents will want to focus the bulk of their attention on their children. We’re still exploring how best to leverage for the gospel the community participation we receive. Some persons are troubled by events like this, feeling that Christians would do better to steer clear of Halloween completely. While there is worthy discussion to be had on appropriately engaging the culture, we hope our event in some way helps remove barriers to the gospel for our neighbors. Rob Burns is the Associate pastor of Crestwood Presbyterian Church. He and his family have been close friends of my family since the late 80s. He has done solo pastorates in Pennsylvania and in Missouri before his current call in Richmond. My name is Rosarela Atkinson I am a Christian woman, married with 3 adult children. I am a nurse and a counselor and I love My Lord Jesus Christ with all my heart. I become a Christian 20 years ago in Australia, the love of God was so evident in the community where I received Christ as my Lord and Saviour that I surrender my life to the living God. At that time I was a simply housewife and the only Christian person in my direct and super extended family, by the grace, love and direct encouragement from The Lord I lead my family,my extended family, friends an perfect strangers to the Lord and I am still doing it in a daily basics. Is three things involved in bringing people to Christ. 1. I become very close friend with God, I do have a close relationship with Jesus by spending time with him. 2. The more time spending with Jesus I become like him therefore people saw the expression of his love not only in words but by my behaviour and actions, I just love people. 3. I never compromised the truth word of God people are looking for truth leaders and good role models, and Jesus is the one, I am only his ambassador and therefore my honesty and integrity is required 24/7. I am praying that your community will become more like Jesus and less like themselves, that people will see the love and light of God in your congregation, that all of you walk hand by hand with Jesus and more than anything that you as a leader will consul God for directions and guidance. May our Lord fill you with his wisdom. In Christ Jesus.